This book, which includes extensive explanations, real - life stories of patients and partners, and treatment options, should be of great value to sufferers, partners, family members, healthcare professionals and spiritual leaders who will now be able to better understand the nature and management of these conditions. 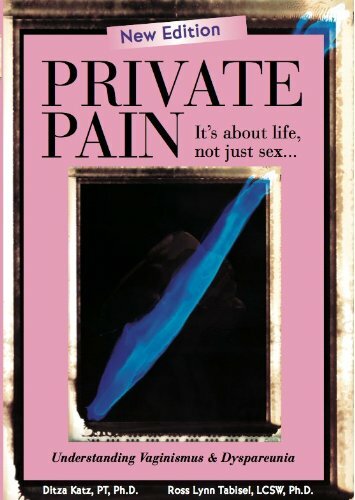 Private Pain is available in paperback from Amazon or from most major ebook vendors. Vaginismus and dyspareunia are common female conditions, affecting lives on many levels and causing physical pain, emotional anguish, and the sense of failure and sexual inadequacy. The shame that is associated with the inability to have vaginal penetrations often forces women into hiding behind a veil of silence. Healthcare professionals share the frustration in encountering a void in available resources and training regarding proper management of these conditions. This book, which includes extensive explanations, real – life stories of patients and partners, and treatment options, should be of great value to sufferers, partners, family members, healthcare professionals and spiritual leaders who will now be able to better understand the nature and management of these conditions. Chapter 1: Am I the Only One? Chapter 4: What Is Vaginismus? Chapter 6: Is There a Cure for Vaginismus? Chapter 7: What Causes Vaginismus? Chapter 14: How Do Teen Girls Perceive Their Body? Chapter 15: Yes, There Is a Cure for Vaginismus!